This entry was posted on August 9, 2014 at 4:31 pm and is filed under 1980s, Heavy Metal, Heavy Metal and the 1980s, Music, Rock, Uncategorized with tags April Wine, Canada, Classic Rock, hard rock, Heavy Metal, Heavy Rock, Nature of the Beast, The 1980s. You can follow any responses to this entry through the RSS 2.0 feed. You can leave a response, or trackback from your own site. I never heard of them before watching Trailer Park Boys earlier this month. To be fair, I’ve never heard of Triumph either except from seeing their logo a lot. Listen to both of these bands, you’ll be in for a real treat. 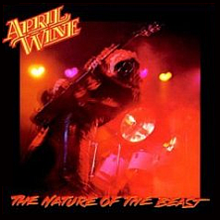 Oh man I grew up with April Wine. I hear some of these songs on the radio here every day. Great to read that Canadian radio is keeping them alive. Absolutely. Sign of the Gypsy Queen regularly. In fact — I really grew to appreciate April Wine via the radio. Oowatanite is such a cool tune, that one gets a lot of airplay still. This was my first April a Wine purchase as well than I went back and bought Harder Faster. This is and was a bunch of classic great songs and yep Just Between You and Me is a kicker of a ballad the guitar work on it is fantastic and your right it should have set the bar for power ballads. I always dug All Over Town, cool tune and for me back than next to Molly Hatchet they were the only 3 guitar band that I knew of. I never did get to see them live back in the day but many yrs later(1993) they showed up in my hometown and played a co headline with Foreigner . Great album thanks for bring some life back to it….. It was my pleasure. “All Over Town” is quite good and well spotted with Molly Hatchet. Blue Oyster Cult also does a three guitar attack but only on certain songs. April Wine and Foreigner, that must have been real cool. Heard the name, but not the music. You’ve convinced me to check them out. As for Canadian artists, I noticed Lee Aaron has gone back to the rock songs. She always had one of the best voices anywhere in rock music. I’m glad I was able to convince you and it’s also great to hear that Lee Aaron has gone back to rock songs. You’re spot on about her having one of the best voices in music. Lee Aaron is indeed back to rock, and she appeared on two songs on last year’s excellent Metal on Ice EP! Always great to know. Welcome back Lee! Lemme tell ya man, I think she’s sounding and still looking as good as ever. I’m really impressed. The Fountain of Youth must be real, because Lee Aaron has found it. I like a lot of her jazz music too. “I’d Love To” is a really fun song. Cool, I’ll have to listen to that jazz song but I shouldn’t be surprised. Lee’s voice has always been that good. 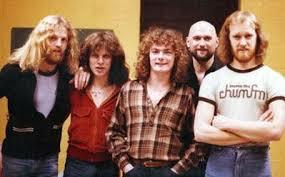 Growing up in Toronoto during the late ’70’s and well into the ’90’s, I heard a LOT of April Wine. Of course there was also Rush, but FM, Trooper and the great Max Webster (Hangover…one of the best guitar riffs of all time!) were played often as well. Oh, and then ther was Prism, the Canuck version of STYX! Hey don’t worry, I’m the world’s worst typist. You list a fine array of great Canadian bands here and I should add Triumph here along with Lee Aaron and my favourite Canadian band, The Killer Dwarfs.